To say that JR Norris had a tough start to his season would be a colossal understatement. Coming into the 2005 season for his second year in the potent Richie Wauters-owned #5, Norris was one of the favorites for the 2005 SES crown. However, things couldn’t have started much worse for Norris. He suffered mechanical problems in the opener at Greenville (SC) and then backed it up by finishing near the rear of the field at Houston a week later. Norris was down and out and his luck wasn’t much better. Then came South Boston (VA). Norris ran a strong third at the tight bullring and got his season turned around. He said it felt like a win. That was big heading into Nashville Superspeedway. 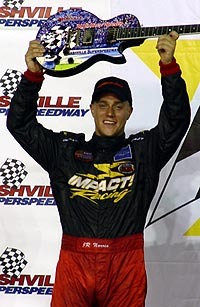 It was on Nashville’s 1.33-mile concrete surface that Norris picked up his first SES win last season in a car that he bought from Charlie Bradberry, who won at Nashville in the same car in 2003. On Friday night, Norris showed he has found a knack for the Nashville Superspeedway, winning yet again in convincing fashion. In Victory Lane, he thanked his parents, his crew, some hard work and a little bit of luck. For the speedway races, Norris uses his own car and equipment, as opposed to the rest of the year when he uses all of Wauters’ equipment. 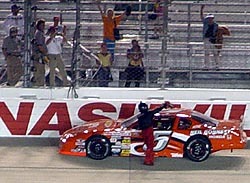 The car, Bradberry’s old car, has now won three-straight Nashville Superspeedway events. “There were a lot of guys that were fast tonight. This is a tough race to win. It only goes to show what good teamwork, hard work and effort can do for you. I’m really ecstatic because it is two in a row and not a lot of people can do that. Some people have troubles getting just one. So hopefully we can go into Kentucky next weekend and have a good run. The race wasn’t as easy as it sounded for Norris. Qualifying was rained out, meaning Norris had to start from the eighth spot due to his spot in the Owner’s Standings. Norris had clocked in with the second-quickest time in qualifying before rain washed out the session before it was complete. Williams used the draft well and worked his way around Norris on lap 43. On lap 48, Norris got back around Williams when he got caught up behind lapped traffic. Williams got the lead again before Norris took it back one more time, utilizing a little slip by Williams when passing the lapped car of Robert Richardson. For all the problems that Williams had during the day, he was happy just to be able to finish. “We went down in the first lap and I don’t know what happen,” said Williams of his contact with Fultz on turn two of the first lap. “I don’t know if I came down on Jeff or if he came up into me. I just don’t know. I recovered two or three times down the back straightaway and finally looped it around. We didn’t hit anything and everything was fine on my end. 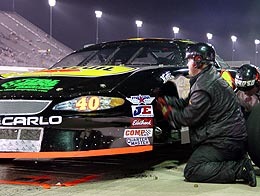 As Williams came back through the field after his late pit stop, Erik Darnell, who was returning to the series for the first time in 2005, moved into second and was slowly cutting down the lead Norris had built. However, with no late cautions, Darnell could do nothing but watch Norris cruise to the finish. Dusty Williams stayed right with JR Norris for a good portion before having to pit for a tire rub. After working his way to the lead past Jason Hogan on lap 10, Norris cruised, with Cecil Chunn and Dusty Williams in tow. Williams, who started on the pole and came back from a first lap spin after contact with Jeff Fultz, made his way around Chunn and set his sights on Norris. 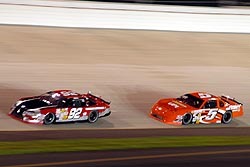 Norris (#5) made his way around Jason Hogan (#92) for the lead on lap 10 and led 80 of the next 90 laps for the win. There was no stopping Norris though, who won by just over two seconds and earned his second Gibson Guitar in two years. He also now finds himself fifth in the points now after tough start to the year. ‘We’re climbing. We’re climbing,” added Norris. . We are gaining some momentum. We’re going to get there. I think I got the monkey off my back and now we can focus on the big picture. I think we can still do it and hopefully we’ll be standing on the podium at the end of the year. Gary Helton finished strong fourth to recapture the Rookie of the Year points lead. Series regular Allen Karnes was able to finish with a strong fifth-place finish. Norris stopped on the front straight to salute some of the fans that stayed late into th evening to watch the rained-delayed event.